The Netherlands and Australia on Friday held Russia responsible for the downing of the Malaysia Airlines Flight MH17 in Ukraine in 2014 that killed all 298 people on board. “On the basis of the JIT’s conclusions, the Netherlands and Australia are now convinced that Russia is responsible for the deployment of the Buk installation that was used to down MH17. The government is now taking the next step by formally holding Russia accountable,” Dutch Foreign Minister Stef Blok said. JIT stands for the Joint Investigation Team, comprising the authorities from Australia, Belgium, Malaysia, the Netherlands, and Ukraine. The team presented Thursday its findings in a news conference in the Netherlands saying a Russian missile shot down Flight MH17. The JIT said the missile that downed the plane resembled another Russian-made Buk missile that crossed into Ukraine from the Russian city of Kursk four weeks prior to the incident. The team said the Russian 53rd anti-aircraft brigade was in possession of the missile. “It has now been indisputably proven that there is a direct link between the rocket that hit MH17 and the Russian army,” Blok told a news conference in The Hague. “We call on Russia to accept its responsibility and cooperate fully with the process to establish the truth and achieve justice for the victims of Flight MH17,” he said. Blok said the possible next step might be to take the case to an international court, adding that the Netherlands and Australia will seek financial damages. 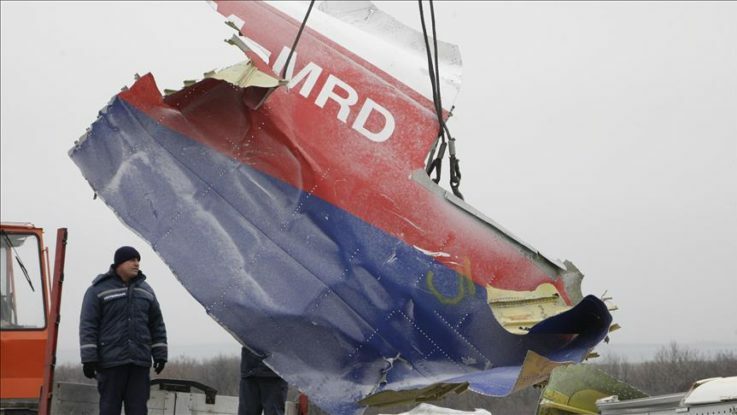 The Kuala Lumpur-bound flight from Amsterdam was shot down above the troubled state of Donetsk in eastern Ukraine from pro-Russian separatist-controlled territory. In response to the JIT statement, the Russian Defense Ministry rejected the accusations. “The Defense Ministry of Russia, both in the first hours after the tragedy and later, officially refuted the insinuations of the Ukrainian side about the alleged participation of Russian military personnel in the accident in the sky of Ukraine and provided the Dutch investigative group with the relevant evidence,” the statement said. Russia is concerned that the investigators “focused on the justification of its findings through the use of only images from social networks subjected to skillful processing by computer graphic editing,” it said. The U.S., however, voiced strong support for the Australian and Dutch call to hold Moscow accountable for MH17’s downing. “It is time for Russia to acknowledge its role in the shooting down of MH-17 and to cease its callous disinformation campaign,” State Department spokeswoman Heather Nauert said in a statement. “Russia’s aggression in Ukraine since 2014 has led to more than 10,300 conflict-related deaths, including those lost in the MH-17 tragedy. It is more than time for Russia to end this violence,” she added. Earlier on Friday, the British foreign secretary said the U.K. fully supports Australia and the Netherlands in their request to Russia to “accept state responsibility” regarding the downing of the Malaysian passenger plane MH17 in Ukraine in 2014. “It is vital that this work continues towards prosecution,” Boris Johnson said. He also accused Russia of undermining the investigation through “the deluge of disinformation” and urged Russia to “provide any requested assistance to the investigation”. The open source investigative search network Bellingcat identifies “Russian citizen Oleg Vladimirovich Ivannikov” — who is known as Andrey Ivanovich, a high-ranking Russian military intelligence (GRU) officer — as the key person of interest in the ongoing investigation of the downing of Malaysian Airlines Flight MH17. According to the report, Ivannikov supervised the procurement and transport of weapons across the Russia-Ukraine border.